What began as a weekend job for a local muralist, soon became an obsession. 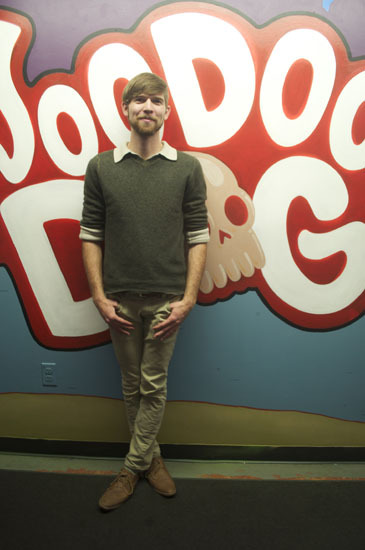 Kemeys Goethe, a fine arts student at FSU was commissioned to paint eight interior walls of the Voodoo Dog restaurant in August. Over 200 hours later, the mural is now completed. Kemeys has been painting murals locally since 2008, his commissions include music venues, churches, boxing gyms, tattoo shops, college greek organizations, bedrooms, and a local art gallery. 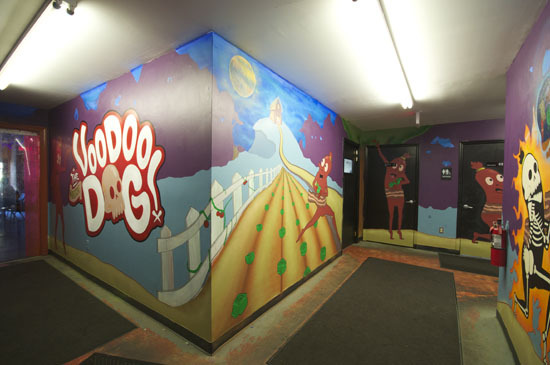 The Voodoo Dog mural spans over 7,928 feet, depicting ‘The Apotheosis of Frank’, a tale of an average hot dog, Frank, and his ascent into divinity. Voodoo Dog has been around since 2009 and is located east of St. Michael’s Pub on Gaines and Macomb. Check out the best hot dogs in town, and Kemeys’ huge mural Monday-Friday 11:00am-9pm, and Saturday/Sunday from noon-6:00pm.